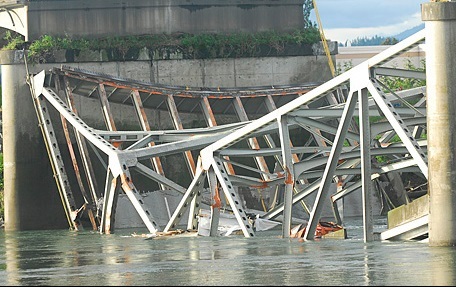 Collapses & Sinkings: History of Bridge Failures in Wash. Collapsed a week after being resurfaced; poor steel, metal fatigue, and a previous impact by another bridge swept downstream during a flood in 1894 were cited as possible causal factors. 5-7 killed, 10 injured. A suspension cable snapped sending the entire bridge into the Cowlitz and killing at least 35 people. Aerodynamically poor design resulted inaeroelastic flutter. Bridge completely destroyed, no person killed, but one dog killed and three vehicles lost. An over loaded log truck drives over over the rural, wood-decked, steel pony-trussed bridge spanning the Hoko River. The bridge collapses. Blown pontoon hatches combined with extreme windstorm causes the problem that will sink the Western drawspan and western pontoons; other sections survived. The bridge collapsed under weight of a truck hauling an excavator. Oversized semi-truck load carrying drilling equipment from Alberta clipped top steel girder causing the bridge collapse.